Approximate Dimensions: 31" x 45"
If your fireplace looks plain and needs something extra to help improve its looks, this hearth rug can create the additional visual appeal that you are looking for without breaking your budget. The durable design is resistant to stains, and it can be used in any weather. The strong material can help protect your flooring from heat or debris, and the versatile design allows you to clean this with soap and water, making it easier than ever to maintain the area in front of your fireplace. If a burning piece of wood hit this rug will it catch on fire or just smolder? Olefin rugs are highly flame resistant. When contacted by flame, the rugs will simply singe without smoldering or burning. Does this need a pad under it to keep it from slipping? This rug should indeed have a non-slip backing added to keep it in place on hard surfaces. 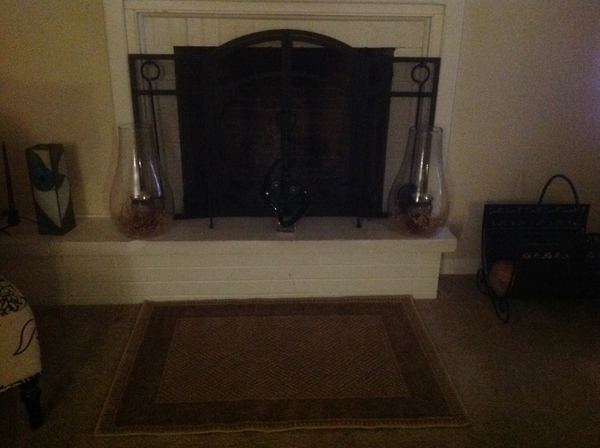 A product that works well is the Goods of the Woods Non Skid Pad for Hearth Rugs - 5 Foot x 3 Foot. The material can be easily trimmed to fit different sized rugs. What color is this rug? 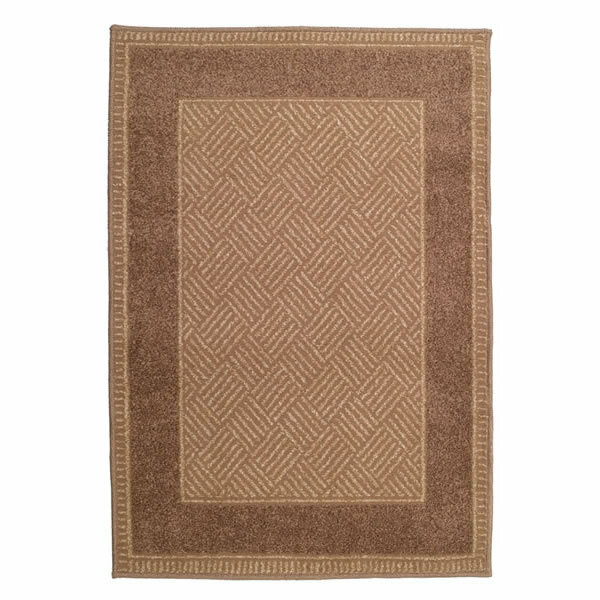 The "flax" color that the manufacturer uses to describe this rug can best be described as a medium tan color. I started a fire in the fireplace immediately after putting it on the floor and an ember flew out on it within 5 minutes. It burned a hole in the rug but did not go all the way through to my hardwood floor. It definitely was worth the money! The rug looks good and is performing as stated. Luckily, we have not really had any burning logs to fall on the rug. I would recommend the rug to others. Arrived exactly as advertised. Nice piece for the price. Looks good in front of my Woodstock! Not very thick, burn marks obvious. I wish this rug was thicker. 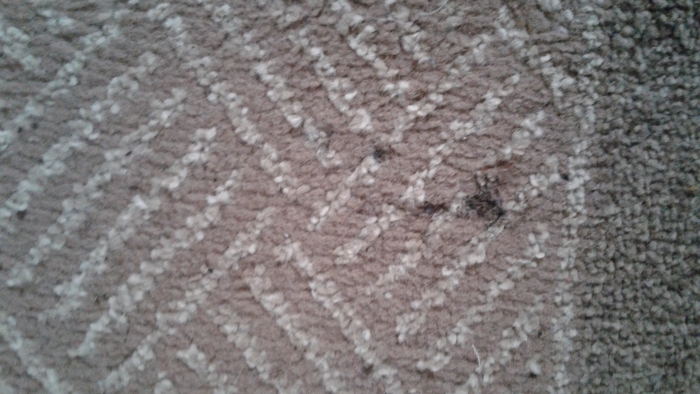 It is very thin, and we have burn marks after 1 month using this rug. 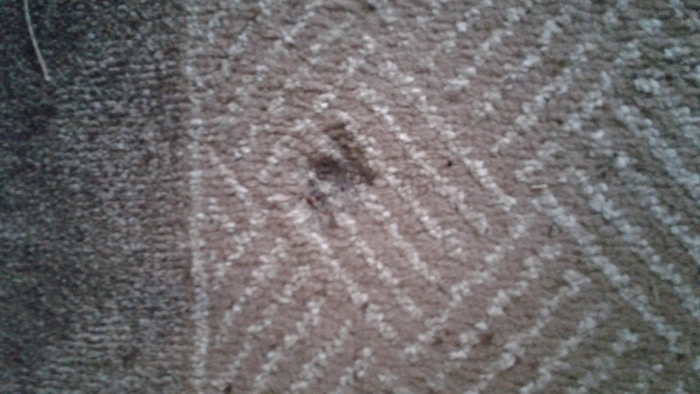 It did not burn through the rug, but did leave noticeable marks. I do not believe we will get more than 2 seasons from this rug and will need to replace it. We will buy a wool rug next time, way better at extinguishing hot cinders. It will also protect our floor better. ConsNot nearly thick enough. We use our Woodstove everyday and would have liked this rug to be tougher. Perhaps those who never have hot coals fall on rug, or sparks fly out will be satisfied with this rug. It is very decorative. The rug I ordered was just what I needed. Very low price too. This olefin rug is exactly what we had in mind for in front of our fireplace. Fits perfectly and matches our great room decor exactly as depicted on the website. We are very pleased. It does require a rubber non slip mat underneath (not supplied). But, no big deal. Prosperfect color as depicted on website; fire and ember resistant; ideal size for standard fireplace. Looks very nice in front of my fireplace. Very durable. Rug was just what we wanted. Already has saved our floor from hot ambers. Nice, reasonably priced fireplace rug. Looks nice - has several burns in it from the fireplace, but never caught fire. Will be ordering another one since the current one has so many burns marks on it. Very happy with price and quality! We use our Orian hearth rug in front of our Earth Stove and it saved our wood floor from being burned by a large live coal that fell out onto the rug. Very pleased with the rug. Searched for a while for this look, not wanting the usual find of the country or floral designs of most hearth rugs. It arrived quickly. Very simple,clean line look. Fit right in with our hardwood floors. Great backing, won't scratch floor surface. The only problem is that a small ash popped out of wood stove and burnt a hole immediately. Going to try to repair it, still like the overall appearance of it. Consburns too easily for being fire-retardent. First ash popped out and burnt a hole very quickly. Rug arrived promptly and looks much better than how it looks in the picture - just the right size and good quality for the price!! When necessary, will have no problem purchasing other items from this store! !